Provide Mosquitoe nets to prevent malaria in the western Vietnam region. Each net costs only $5 but can mean the difference between a healthy and a sickly family Provide basic medicine and supply for free clinic in the Hue area. Lua Viet has contributed $1000 in 1997 and $1000 in 1998. Construct deep wells to provide clean water for the villages in the Central Highland area where water is scarce. Each well costs $100 and can supply an entire village, preventing disease from the use of polluted streams and ponds. Pay for surgery for children born with cleft palate. This congenital defect leaves an otherwise healthy child psychologically handicapped. Each surgery costs only $70, about the price of a Broadway show. Yet it can bring to a child a lifetime of smile. Distribute brochure on the prevention of Aids in Saigon, Nha Trang. 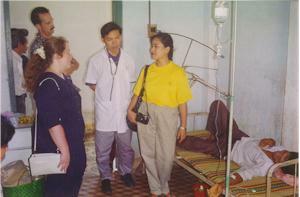 Lua Viet colleages targeted the prostitute population in an attempt to help the people most vulnerable to this preventable disease.